On The Americans Season 4 Episode 13, William was compromised when he's captured trying to make a drop. But how compromised was he? That's the thing. Obviously, he's unable to communicate with anyone, so Gabriel, Philip and Elizabeth were flying without a net. That meant nobody knew if they were safe or going to be raided any minute. With Paige dating Stan's son, Matthew, did that mean they'd be any better off if things went bad? William went to dire lengths to ensure he wouldn't talk. With Stan and Aderholt watching his every move, surely he'd slip up. 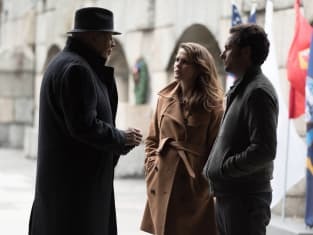 Find out what happened on the finale and Gabriel's surprising declaration when you watch The Americans online right here via TV Fanatic.